2018 World Cup: Morocco thrash Mali as Tunisia and Cape Verde also win - The Maghreb Times ! Morocco put six past Mali as Cape Verde stun South Africa and Tunisia beat DR Congo to maintain their 100% record in 2018 World Cup qualifying. Morocco overwhelmed Mali 6-0 in Rabat on Friday night as the 2018 World Cup qualifiers continued across Africa. 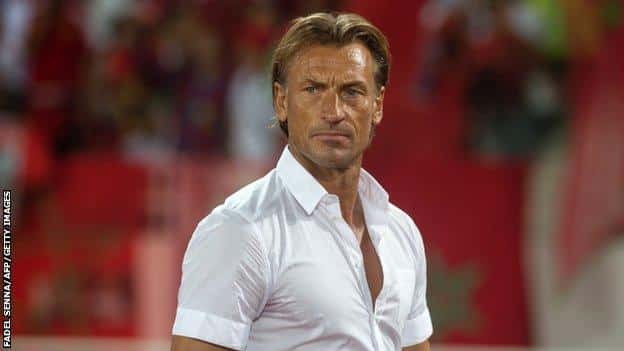 The victory put Herve Renard’s side top of Group C, one point above Ivory Coast who play in Gabon on Saturday. Elsewhere on Friday night, Tunisia defeated the Democratic Republic of Congo 2-1 to move three points clear at the top of Group A, and there was a shock for South Africa as they fell to a 2-1 defeat away to Cape Verde in Praia. Dutch-born Moroccan midfielder Hakim Ziyech marked his return to the Atlas Lions side with two goals as they went to the top of Group C with a 6-0 home win over Mali in Rabat. Ziyech had previously fallen out with Morocco coach Herve Renard, but the two met in July and reconciled. Ziyech put Morocco ahead from the penalty spot in the 19th minute with Khalid Boutaib adding a second eight minutes later. A flurry of second half goals followed for the hosts, as Ziyech hit his second just after the half-hour mark. Achraf Hakimi, Faycal Fajr and Mimoun Mahi all added to the Moroccan tally to secure a big win. Tunisia kept up their 100 percent record in the African qualifiers as they edged the Democratic Republic of Congo 2-1 in Tunis in their top-of-the-table clash in Group A.
Yassine Meriah put Tunisia in front with an 18th minute penalty as Cedric Bakambu then hit an equaliser for DR Congo just before half-time. Tunisia sealed the victory through Ghailene Chaalali’s 47th minute winner. The Congolese can go back level with Tunisia if they win the next clash between the two in Kinshasa on Tuesday. Nuno Rocha scored both goals for Cape Verde, the second from a unnecessary penalty given away by South African midfielder Dean Furman. South Africa rarely looked like levelling and were reduced to 10 men entering the final quarter when defender Erick Mathoho got a straight red card. Burkina Faso and South Africa have four points in Group D and Senegal and Cape Verde have three, ahead of a match between the Senegalese and Burkinabe in Dakar on Saturday.